I love making easy dinner recipes that are healthy, easy and delicious. 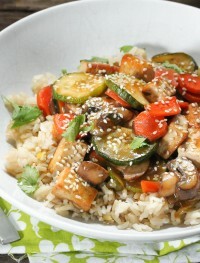 Because I love Asian food so much this Quick Veggie Tofu Stir-fry was what we had for dinner today. 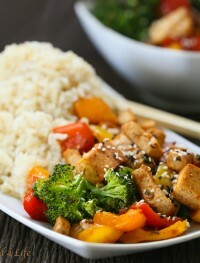 Vegan, gluten free and better than take out! 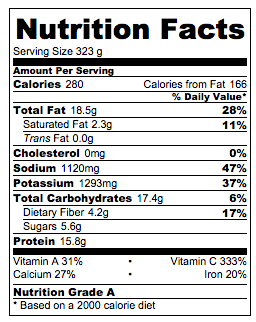 I have been using tofu for the longest I can remember. 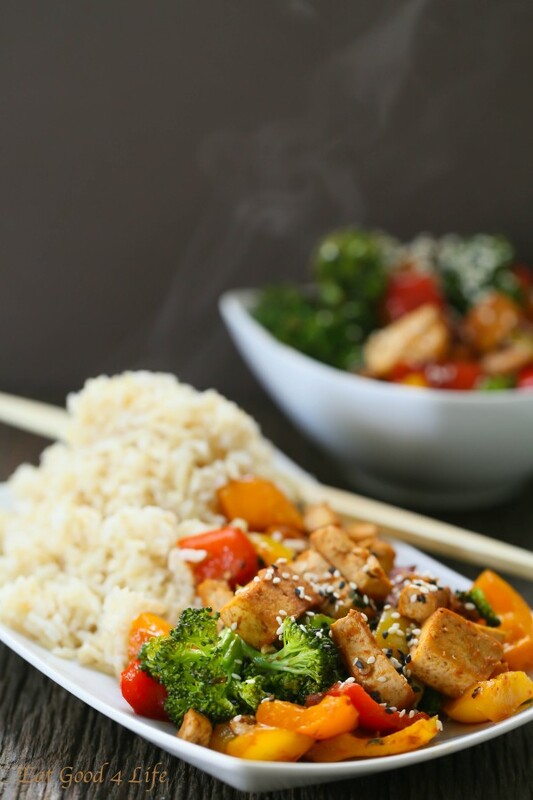 Most of the times I use extra-firm tofu because it holds great especially when using it for stir-fries and dishes such as this quick veggie tofu stir-fry. By now you must know that I love Asian cuisine. It is one of my favorite go to cuisines when I want to whip something quick and tasty…well pasta dishes too, but Asian food is just my ultimate favorite. I don’t remember the last time me and my family actually went out to dinner to eat Asian food. Once you gather the few especial ingredients you need to cook Asian cuisine, you are able to whip up almost every single dish. I find that stocking my pantry with curry pastes, soy sauce, rice wine vinegar, sesame oil and coconut cream or milk allows me to have an array of Asian dishes. I guess I am lucky enough that I have an Asian market near by. On another note, in about 4 weeks I am leaving the US for Spain. I am going to be there for almost 2 months. Last year, me and my family didn’t get to go. I was really bummed about it but we really couldn’t pull it off. Plane tickets for a family of 4 are quite expensive but this summer we were able to come up with the money so I am really pumped to make it happen. I am planning to cook with some of my aunts and hopefully record some of the recipes. I have been wanting to do this for a long time. I anticipate this being a lot of work but I will try my best to make it happen. Anything for food! Anyhow, I won’t bored you anymore with my summer plans. 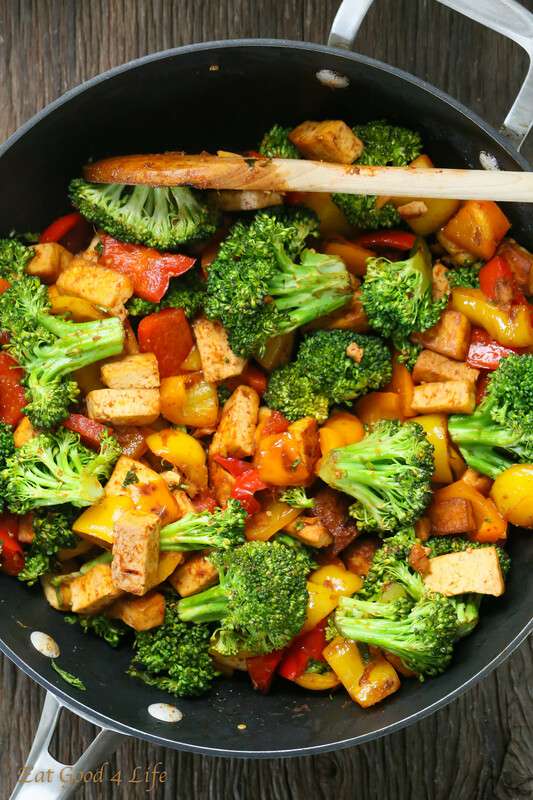 I leave you with this super quick veggie tofu stir-fry that not only is vegan but gluten free. In a small mixing bowl mix the sauce ingredients and set aside. In a large non-stick skillet place the oil and tofu and cook for 2-3 minutes or until it begins to brown around the edges. Add the chopped peppers and ginger and cook, stirring in between, until the peppers are tender. About 5 minutes. 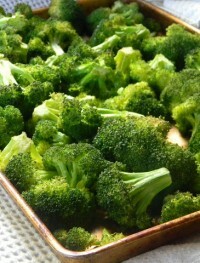 Add the broccoli and cook further for 2 minutes. Add the sauce and stir making sure it coats the veggies and tofu. Turn the heat off and add the sesame seeds. NOTE: You can use any colored peppers of your choice. I love how it turned out…so fresh, healthy and delicious! I love, love, love veggie pizzas! Looks beautiful, too. Love this type of recipe! This looks really delish… thanks for sharing! I looooove me some white pizza! And I would definitely add those red chile flakes. Especially with the broccoli! 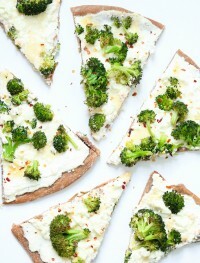 Ricotta and broccoli are two of my favorite pizza toppings, yum! This looks really delicious. Would also make great calzones, just fold the dough over and make little individual “pizza pockets”. Thanks for the recipe. Looks different! Broccoli in a pizza? It’s very seldom in our counts! Sound like I have to try this one!